Yes, I’m working on a scarf on a day that it has been hot, hot, hot. The high today was 97, making it the kind of day that I try to be outside as little as possible. Yet, I continue to work on scarves for this project. 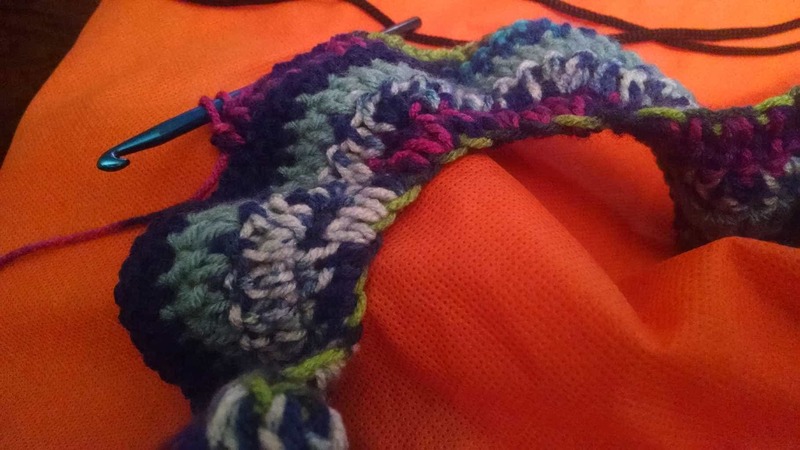 In some ways a scarf is a perfect summer project – it’s easy to move around, very portable, and doesn’t grow to a size that is uncomfortably warm to work on. It can easily be carried along on a trip and worked on when a few free moments present themselves. In addition to being easy to work on in the summer, our scarves are needed in the summer! Last year two of the summer months saw a need for at least 50 scarves per month. Yep, 50 lives changed in less time than it takes to gather the supplies and choose a pattern for a scarf. And, just when I wonder – should I keep crocheting scarves, should we keep packaging them and getting them to the YWCA…I come across someone who has received one or knows a recipient and they tell me how meaningful it is to receive a scarf following such a traumatic event. Knowing someone has gone before you and cares that you know you’re not alone can make a huge impact at a really tough time. So, yes, let’s keep making scarves in the summer! They are needed now as much as anytime during the year.